IEKEI is a kind of Ramen, and it is also the name of a famous ramen shop. IEKEI Ramen was created in 1974 in “YOSHIMURAYA”, Kanagawa, Japan. The founder of “YOSHIMURA” worked as a truck driver, but one day, he was inspired by a genuine idea, he thought : how about mixing Tokyo’s ramen and Kyushu’s ramen, it should be amazing! Basically almost “IEKEI” Ramen shops are named in the end with the word “家”(“IE”), that’s why it has been called “IEKEI” (“KEI” means like a group). Inside almost the shops, it is prohibited to smoke and customers adopt the ticket system. 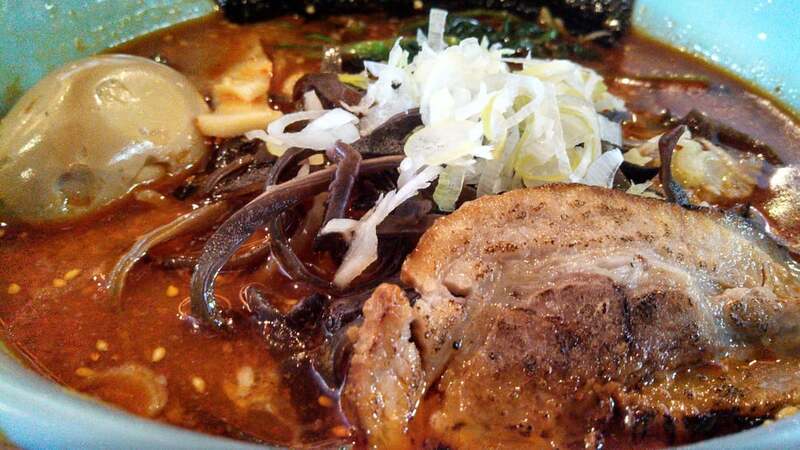 The basics characteristics of this ramen are its thick straight noodle and its soy sauce soup mixed with pig bone. The soup consists consist on a boiled pig bone soup and soy sauce. Then we add noodle that have a different taste as spinach, dried seaweed, and roasted pork, but this can be chosen when you order. IEKEI ramen shop makes Ramen that depends on customer request. for example, we can choose the amount of fat, depth of soy sauce, and firmness of noodles. And usually there are some spices on a the table, for instance, garlic, chili, ginger, pepper, and vinegar, so you can add those spices if you are not satisfied for the tasting. Every spice is free of charge. Basically, the order goes via vending machine. You have to give the ticket to the cookers and they will serve you the Ramen you choose in your table. Normally, the price is less than 1000 yen, but I recommend you to order another menu such rice as usually do Japanese. There are three size of dishes for Ramen: “並(Nami)”, “中(Chu)”, and “大(Dai)”. “Nami” is the normal size, “Dai” is the double volume of Nami, and “Chu” volume is the half of “Nami” and “Dai”. It depends on your Journey. So enjoy! Dine with Domo-kun at the Limited-Time Domo Diner in Yokohama! What are the Best Samurai Movies?